Thanks to expansion and a few clubs changing facilities, USL Championship will feature an array of new host stadium in its 2019 season. The mix of new facilities is an interesting one, as it features established venues, along with new facilities and some receiving extensive renovations. To give an overview, here is a list of stadiums new to USL Championship in 2019. After spending last year at Coolray Field—a Minor League Baseball ballpark—United 2 is shifting home games this season to Kennesaw State’s Fifth Third Bank Stadium. The on-campus facility is used by the university’s football, women’s soccer, and women’s lacrosse teams, offering a capacity of 8,300. It also has prior experience hosting a professional soccer club on a full-time basis, as it was home to the Atlanta Beat of the bygone Women’s Professional Soccer from 2010-2011. Constructed on the Circuit of Americas campus, Bold Stadium is a 5,000-seat soccer-specific facility. The expansion Bold broke ground on the stadium in October and will play its first home match there on March 30, when it hosts San Antonio. For the past three seasons, the Steel had played home matches at Goodman Stadium, which is primarily the home of Lehigh University football. Beginning this season, however, the Steel will join MLS parent Philadelphia Union at Talen Energy Stadium. Talen Energy Stadium was completed in 2010 and is located in the Philadelphia suburb of Chester. Located on the University of Alabama Birmingham’s campus in downtown, the stadium has undergone a renovation/expansion to accommodate Division II professional soccer. The Legion, who are beginning USL Championship play this season as an expansion club, signed an 8-year lease with the university in 2018. Opening in 2014 as a Minor League Baseball ballpark, Southwest University Park will host both the Locomotive and El Paso Chihuahuas (Class AAA; Pacific Coast League) starting this season. MountainStar Sports Group—which owns both teams—is expected to pursue a new soccer-specific stadium for the Locomotive down the road, but for now Southwest University Park should provide a solid home. The downtown facility has been praised since opening for baseball, and is receiving some upgrades to accommodate the Locomotive. After years of renovation pursuits that included a botched effort for an NASL club, Hartford is now seeing a new life for the venerable Dillon Stadium. The Athletic, backed by an ownership group led by local businessman Bruce Mandell, is working with local and state officials to renovate the stadium to receive a new turf field, modern locker room facilities, fan amenities such as concessions, restrooms, seating, and more. Some unforeseen complications early in construction delayed the stadium’s renovation schedule, but the Athletic is currently scheduled to play its first home game there on May 10. Planned as part of a larger D.C. United complex in suburban Loudoun County, VA, the new stadium will seat 5,000 and feature Division II standard facilities. 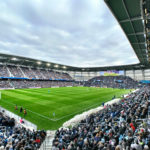 It is currently not scheduled to open until August, with United slated to play just six home games before the stadium opens, with the remaining 11 home matches played between the facility’s opening and the end of the USL Championship season in October. The situation in Memphis is similar to that of El Paso, as an established minor-league ballpark will play host to two clubs under the same ownership. In this case, Peter Freund is the Principal Owner of 901 FC and baseball’s Redbirds (Class AAA; Pacific Coast League), while longtime Redbirds president/GM Craig Unger serves as president/owner of the soccer club. AutoZone Park is located in downtown Memphis, and originally opened in 2000. Another established minor league ballpark, Isotopes Park will be home to both baseball’s Albuquerque Isotopes (Class AAA; Pacific Coast League) and expansion United starting this season. The facility opened in 2003 and features a seating capacity of 11,124, with a large berm located beyond baseball’s right field wall being one of its more notable amenities. Rendering of Southwest University Park courtesy El Paso Locomotive FC.